The Clean Power Plan announced by President Obama on August 3rd sets the first-ever limits on carbon pollution from power plants, the nation's largest source of the pollution driving dangerous climate change. We are already seeing the impacts of climate change in extreme weather, drought, wildfires, floods, and many other disruptions to the world we depend on. Limiting carbon pollution from the nation's power plants is the single biggest step we can take to fight climate chaos. That makes the Clean Power Plan a game-changer. This post, co-written with Derek Murrow and NRDC's outstanding analytical team, explains what the Clean Power Plan means and how it works. We've published an extended version of this post as a fact sheet. Check out NRDC President Rhea Suh's post on the Clean Power Plan, these other posts by NRDC experts, and NRDC's Clean Power Plan Resource Book. The Environmental Protection Agency (EPA) issued the final Clean Power Plan under the Clean Air Act, the nation's fundamental air pollution law. The Plan sets flexible and achievable standards that give each state the opportunity to design its own most cost-effective pathway toward a cleaner electricity system. This historic step to rein in power plant pollution will speed America's transition away from fossil fuels, protect our health and help to safeguard future generations from the worst effects of climate change, and position the United States for global leadership on climate change. The Clean Power Plan will sharply reduce carbon pollution and other dangerous air pollutants by shifting our electric power system toward cleaner energy sources at a steady but achievable pace. 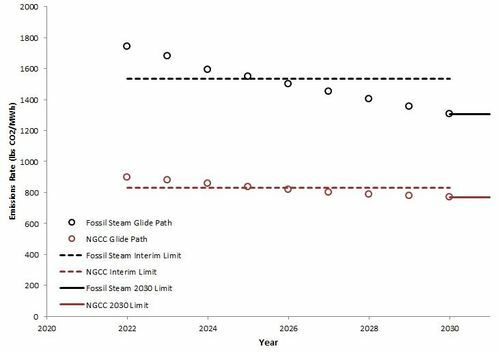 Enforceable carbon pollution limits will kick in starting in 2022 and ramp up into full effect by 2030. Power companies will start acting sooner than 2022 in order to get ready and in response to additional clean energy incentives in the Plan. The EPA projects that by 2030, the Clean Power Plan will cut the electric sector's carbon pollution by 32 percent nationally, relative to 2005 levels. In 2030 alone, the EPA projects that there will be 870 million fewer tons of carbon pollution. This is like canceling out the annual carbon emissions from 70 percent of the nation's cars, or from the annual electricity use of all U.S. homes. By shifting our electric grid toward cleaner electricity, the Clean Power Plan will also cut other power plant pollutants that cause asthma attacks and respiratory illnesses. The EPA projects that the Plan will prevent thousands of premature deaths, 90,000 fewer asthma attacks in children, and 300,000 missed work and school days in 2030. Economists put a value of $20 billion on the Clean Power Plan's climate benefits in 2030, and a value of $14 billion to $34 billion on the lives saved and other health benefits. While the Plan will involve compliance costs of around $8 billion in 2030, total benefits will exceed costs by $26 billion to $45 billion. The shift to energy efficiency and cleaner power will save the average American family $85 on its electricity bills in 2030. These electric bill savings will total $155 billion over the decade leading up to 2030. The EPA adopted the Clean Power Plan under the Clean Air Act, which the Supreme Court ruled in American Electric Power v. Connecticut in 2011 provides the legal authority to control carbon pollution from America's fleet of fossil-fueled power plants. Under this authority, the Clean Power Plan establishes a federal-state process for controlling power plant pollution. First, the Clean Power Plan establishes national carbon dioxide emissions performance rates for existing coal- and gas-fired power plants. These performance rates reflect the emission reductions achievable using the "best system of emission reduction" (BSER), taking into account cost and other factors. States then have an opportunity to adopt "state plans"--including enforceable emission limits--for their coal and gas plants. The Clean Power Plan describes multiple ways that states can structure their plans and emission limits. The Clean Air Act does not require any state to adopt a plan to curb its power plant pollution. If a state chooses not to adopt a satisfactory plan, however, our national air pollution law provides a federal guarantee for our health and well-being. In that case, it is the EPA's responsibility to regulate the power plants in that state directly. The Clean Power Plan calls on states to make initial state plan submissions by September 2016. They can receive extensions to complete their plans by September 2018. The plans have to include enforceable emission limits that plants must comply with starting in 2022 and ramping up to full strength by 2030. The EPA must review state plans to determine whether they can be approved. If a state does not submit a satisfactory initial plan by September 2016, or a satisfactory final plan by September 2018, then the EPA must adopt and enforce a federal plan that puts enforceable limits on the state's carbon-polluting power plants. Establishing the "Best System of Emission Reduction"
In the Clean Power Plan, the EPA identified the "best system of emissions reduction" for existing coal- and gas-fired power plants. Because power plants all supply the same product--electricity--and are all interconnected through the electric grid, the EPA determined that the BSER includes (1) measures that can be applied at individual coal plants (such as reducing emissions by burning fuel more efficiently), (2) measures that allow plant owners credit for shifting the mix of electricity generation toward sources that produce less carbon pollution (such as using existing coal plants less and existing gas plants more), and (3) measures that allow plant owners credit for electricity generation with no carbon pollution at all (such as replacing fossil-fuel generation with more power from wind turbines, solar panels, or other zero-emitting power sources). The EPA calls these three types of measures the "building blocks" of BSER. Much greater carbon pollution reductions can be accomplished at reasonable cost using all three building blocks than if plants were limited to equipment or fuel changes at individual sites. One of the biggest improvements in the final Clean Power Plan is that it reflects up-to-date data on the cost, performance, and growth trends for renewable electricity generation. Wind and solar costs have declined by more than 40 percent compared with the EPA's outdated assumptions in the original proposal. As a result, the EPA projects much faster renewable electricity growth, and significantly more emission reduction as a result, than it did in the original proposal. What happened to energy efficiency? In the proposed Clean Power Plan, EPA included a fourth building block, end-use energy efficiency, in setting emission rate targets. Energy efficiency cuts pollution by reducing how much electricity generation we need in order to run our lights, appliances, cooling systems, etc. Some commenters raised questions about using efficiency as a building block for setting emission rates but wanted efficiency measures to continue to count for compliance with those rates. That's what the final Clean Power Plan provides. Energy efficiency will still play a critical role in meeting the Plan's emission limits at low cost. From these three building blocks, EPA established two national emission performance rates as BSER--one for steam generators, and one for natural gas-fired combined cycle (NGCC) turbines. (Emission performance rates restrict how much carbon pollution a plant may release per unit of electricity that it generates, expressed as pounds of CO2 per megawatt-hour, or lbs CO2/MWh.) These limits were applied in the same manner to the states to yield each state's planning target. The EPA carefully analyzed the cost and feasibility of cutting carbon pollution by a combination of the three building blocks, looking at what emission reductions could be accomplished across three big segments of the country's electricity grid (the Eastern Interconnect, the Western Interconnect, and the Texas grid). The EPA used this analysis very conservatively, setting the national emission rate limits on the basis of the least stringent of the results coming from the building block analysis in the three regions. These national emission performance rates will apply to plants starting in 2022, and they will ramp emissions down over the following eight years to full strength in 2030, providing a "glide path" as requested by many industry stakeholders who commented on the original Clean Power Plan proposal. 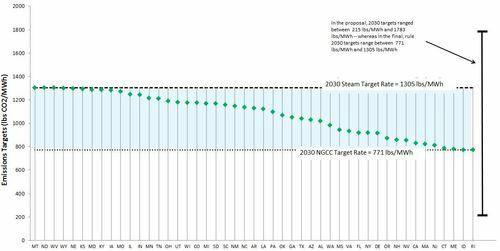 For 2030 and beyond, the national emission performance rates will be: 1,305 lbs CO2/MWh for coal-fired steam generators, and 771 lbs CO2/MWh for gas-fired turbines. The interim and final performance rates and glide paths for both plant types are illustrated in Figure 2. These national emission performance rates treat coal and gas power plants consistently and fairly wherever they are located. Coal and gas plants can readily achieve their respective emission rates using credits from cost-effective investments in clean resources as described below, and they can meet customer needs for reliable electricity services with much less carbon pollution. The Clean Power Plan then gives states a range of flexible options for designing plans to set enforceable limits on power plant pollution. The "two-rate" approach. First, states can choose to write plans that adopt the two national emission performance rates as enforceable limits on their coal and gas plants. Thus, the state plan's enforceable limits would mirror those in Figure 2. Under this approach, each plant needs to meet the applicable enforceable emissions rate limit through a combination of reducing its own emissions rate and investing in emission reducing actions at other locations in the power system, either in the same state or elsewhere in the country. These investments can be made either directly or by acquiring emission rate credits--credits for shifting generation to cleaner sources or improving end-use energy efficiency. A power company can create those credits by taking measures within its own company, by contracting with another company to do so, or by purchasing credits created by others in an emissions credit marketplace. The cost of compliance measures--both in-plant measures and emission reduction credits--then influences which plants run more and which run less. State-specific emission rate limits. As a second option, the Clean Power Plan establishes state-specific emission rate limits. These state-specific limits are a blend of the national emission rate limits for coal and gas plants, weighted to reflect the mix of electricity generated from the two types of plants in each state at the starting point in 2012. The state-by-state emission rate limits are shown in Figure 3 for 2022-2029 and Figure 4 for 2030 and beyond. As in the two-rate approach, each power plant uses a combination of its own actions and emission rate credits to meet the applicable state-specific emission rate limit. The state-specific emission rate limits establish consistent and fair targets for power plants in all states, falling somewhere between the national emission rate limits for coal plants and gas plants. The limits in the final Clean Power Plan thus respond to state and industry concerns that the state limits in the original proposal varied too widely and treated plants and states inconsistently (illustrated by the bar at the right of each figure). In short, the final Plan treats like plants alike, and like states alike. State plans using either of these rate-based approaches must establish an accounting approach starting with each plant's reported CO2 emission rate, and adjusting for emission reduction rate credits acquired from shifts in generation to cleaner sources and energy efficiency. States must verify the authenticity of credits obtained from energy efficiency and from low- and zero-emitting generation. "Mass-based" limits. Many other federal and state power plant pollution programs establish mass-based pollution limits. The acid rain and cross-state smog programs, for example, limit how many tons of pollution a plant may emit each year, rather than the amount of pollution per unit of electricity generated. A number of states, including California and the Northeastern and mid-Atlantic members of the Regional Greenhouse Gas Initiative (RGGI)--have already established mass-based state programs to cut carbon pollution. Many state and industry stakeholders told the EPA that they wanted the option to curb carbon pollution this way under the Clean Power Plan. In response, the final Clean Power Plan establishes equivalent mass-based limits for each state. These limits convert each state-specific emission rate limit to an equivalent amount of tons per year, by multiplying the state's emission rate limit by the anticipated amount of electricity production in the state. The EPA's conversion method includes factors for economic growth and associated increases in electricity consumption. A state can then choose to write its plan to include an annual CO2 tonnage limit for each plant. Compliance under a mass-based approach works differently from the rate-based approach. Under a mass-based approach, the state issues emission allowances equal to the number of tons of emissions allowed in the state. Each coal or gas plant needs one emission allowance for each ton of CO2 that it emits. The cost of allowances then figures into decisions about which plants to operate and encourages a shift to lower- or zero-emitting power. States can decide whether to auction the allowances (using the proceeds for renewables and efficiency programs or customer rebates) or to distribute them by other means. The Clean Power Plan allows states to choose two versions of mass-based plans. A state can include both existing and new fossil-fueled plants, requiring both to hold allowances for each ton of emissions. Alternatively, it can include only existing plants, but in that case the state must account for pollution increases from "leakage"--shifting generation to new plants outside the cap--which would mean that the mass-based limit is no longer equivalent to the emission rate limit from which it was derived. We recommend that states include both existing and new power plants in mass-based plans to avoid creating competitive inequities between plants and the erosion of pollution reductions due to emissions from new plants. The state-by-state emission limits, both rate-based and mass-based, will appear in our forthcoming fact sheet. "State measures" plans. The Clean Power Plan allows for one more type of state flexibility. Some states may want to place obligations, as a matter of state law, on entities other than fossil-fueled power plants to help meet Clean Power Plan goals. For example, a state could adopt a mass-based program that covers other industries as well as power plants. A state also could adopt or enhance "renewable portfolio standards" or other measures that place a state-law obligation on entities other than coal or gas plants to produce clean energy or achieve efficiency gains. The EPA will accept such a plan, so long as it contains enforceable backup limits (in rate-based or mass-based form) on carbon pollution from those power plants themselves. Other state plan requirements. All state plans have to include some common elements. To be approved, a state plan must demonstrate that it has enforceable limits on power plants that will achieve the relevant carbon pollution rate-based or mass-based limits. There must be adequate monitoring and reporting requirements. The plan has to show that the state has considered electric system reliability. The plan must have been developed with public participation and after public hearings, and it must show that the state has engaged stakeholders including low-income communities and other vulnerable populations. When Are State Plans Due? As already indicated, power plant owners can meet their emission limits least expensively through a combination of taking measures at the plants themselves and using emission rate credits or emission allowances, depending on which kind of plan their state adopts. States can submit "trading ready" plans either individually or in groups. States with approved plans can then allow their plants to trade credits or allowances with plants in states with approved plans of the same type. For example, a group of states with mass-based plans (such as the RGGI states) can agree to allow power plants to trade emission allowances with each other across state lines. A group of states with rate-based emission limits can allow power plants to trade emission rate credits across state lines, if the states adopt the national uniform rates or blend their enforceable emission limits into one weighted-average rate. These trading provisions will allow power plants to participate in larger markets and reduce costs, without requiring states to develop and submit formal multistate plans. Early investments in renewables and energy efficiency will help power plants comply with their enforceable limits in 2022 and later years. Energy efficiency or renewable energy projects that started after 2012 can earn credits or allowances for emission reductions they produce in 2022 and beyond; those reductions can count toward compliance with plants' enforceable limits, whether rate-based or mass-based. In addition, the final Clean Power Plan creates a new Clean Energy Incentive Program (CEIP) that will generate additional early compliance credits. The CEIP allows states to award credits or allowances to qualifying renewable electricity generation, and to qualifying energy efficiency savings in low-income communities, for emission reductions achieved in 2020 and 2021 before the compliance period begins. Projects are eligible if they are initiated after the state submits its final state plan. The program is voluntary and rewards states that complete their plans early. Entities that earn credits or allowances in 2020 and 2021 can sell them to fossil power plants for use in 2022 or later to help meet their emission limits. The CEIP program description states that projects can earn credits or allowances up to a nationwide total of 600 million tons. Wind or solar projects will receive a half-credit from the state (borrowed) and a half-credit from the EPA (additional). Low-income energy efficiency projects will generate two credits, one from the EPA and one from the state. The EPA is taking comments on further details of the CEIP as part of the federal plan proposal. The Clean Power Plan assures that power companies will be able to cut carbon pollution and provide reliable electricity at the same time. Reliability is enabled and assured by the many layers of flexibility in the design of state and federal plans, plus the flexibilities provided by emissions trading and early incentives. States have plenty of time to plan and prepare for compliance. 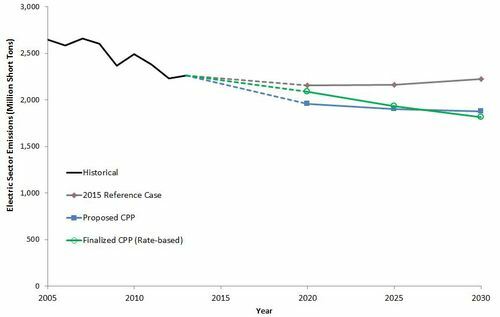 The final Plan phases in emission reductions more slowly than in the proposal. The Plan also requires states to consider grid reliability when designing their plans. And grid operators, states, and federal agencies (the EPA, the Federal Energy Regulatory Commission, and the U.S. Department of Energy) will be working together, planning to meet power needs with pollution control obligations in mind, and watching closely to ensure reliability. As an extra safeguard, the final Clean Power Plan includes a backstop reliability provision to protect the grid in the case of wholly unpredictable emergency events, while keeping the states on track to meet their final targets. States can grant a power plant an alternative, more lenient emission limit for up to 90 days if there are extraordinary circumstances requiring a plant to operate in excess of otherwise applicable pollution limits in order to maintain reliable electricity service. If such operations are needed for a longer period, then the state must make up for the plant's excess emissions through additional reductions elsewhere, or the state must revise its plan to stay in compliance. In short, the power grid will remain strong as states implement the Clean Power Plan. The Clean Air Act, as noted above, creates fundamental national air pollution safeguards. In this program under Section 111(d) as well as several other programs, the Clean Air Act invites states to take the lead by crafting state plans to regulate their polluters in a way that is tailored to state and local conditions. For 45 years, states have almost always chosen to develop and carry out plans to implement Clean Air Act protections. In the rare cases where states choose not to act, the Clean Air Act provides a critical guarantee that the national government will regulate polluters directly. To meet its responsibilities, EPA has proposed the federal plan regulations that it will implement if necessary. The federal plan proposal, now open for public comment, lays out both rate-based and mass-based options consistent with the Clean Power Plan provisions described above. It also includes corresponding "model plan" provisions that states can choose to adopt, simplifying the plan development process. Although some are urging governors to refuse to cooperate, most power companies and other state stakeholders want their states to take the lead, in preference to a federal plan. And most governors appear committed to move ahead. The Clean Power Plan makes history by setting the first national limits on carbon pollution from America's power plants, the largest source of the pollution driving dangerous climate change. It provides power companies and states with a fair, reasonable, and achievable blueprint to cut carbon pollution over the next 15 years. It will deliver public health and climate protection benefits many times its cost. It will create thousands of good-paying jobs that can't be outsourced, and it will help Americans cut their monthly electric bills. Without doubt, the Clean Power Plan is a good deal for America.